Our Hostel works only during summer from 27th of June(6) to 24 of August(8). 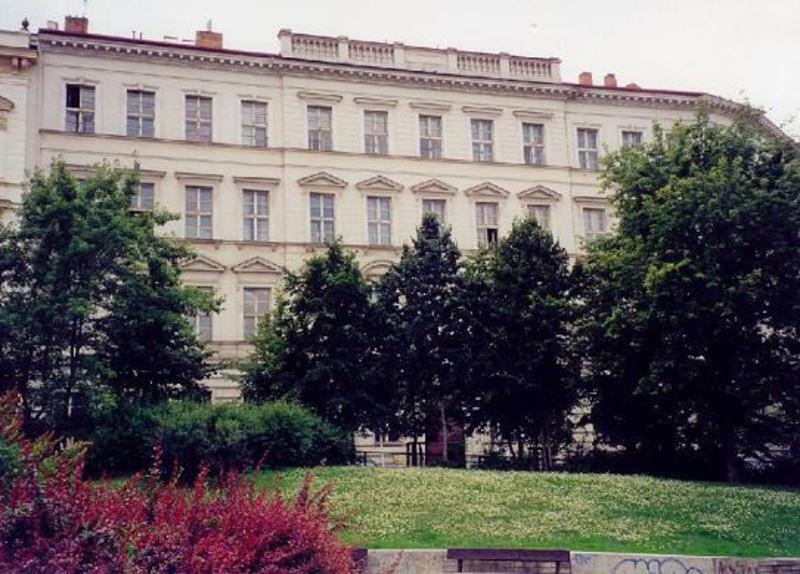 Its in spacious school building situated on little square with small park in center of Prague (5min. to Main Railway station, 8min. to the biggest Wenceslas square). Tram stop (including night trams) is just around the corner. So there is no problem to travel in Prague at any time. We offer accommodation in Double-rooms, smaller private 4-5 bed rooms or in up to 10 bed spacious dormitory rooms (linen and lockers for free). You can use shared guest fully equipped kitchen include fridge (supermarket is close), common room, toilets, hot showers and internet room (internet access isnÂ´t free). Reception is NON-STOP open to let you fully enjoy city and come back at any time. Bar is open from 7pm till 6am. So you can meet up new people on daily parties (absinth, vodka, jÃ¤germaister parties) and join fun in the hostel (table tennis, soccer, water pipe(shisha), playing cards, own music play). There is outdoor playing-field in the Hostel. So you can play basketball, football or whatever you want or just take breakfast out and enjoy relax in the morning. We serve it from 7am till 11am and you can choose from three menus. When you want try special sight-seeing. We offer you rent a bike. Our Hostel have safe parking inside for travelers by car! ***Hostel is for travelers who LOVE FUN. Sometimes people drink more than they can handle so they are noisy or they have conversation till morning!!! ***There are 4 floors and no elevator!!! And fridge is shared, that means as beer what you put in, it wont be here next day, may be!!! ***When you are big group and you full room we give you key to be your privet, but only one key!!! ***We moving beds almost every day, so sometimes it can be different number of beds in room, its because we are trying to do our best to let sleep groups together!!! ***It\'s cheap hostel and we have hard mattresses, because they are healthy. If you want break your backs on soft ones, choose other hostel please!!! ***Breakfast is free for prices from 8,5â‚¬ (210czk) and up. Tools of hostelworld don\'t let me make difference between lower and upper prices, there is only breakfast \'yes or no\'!!! ***If you have any problem ask for manager and i will do my best to help you. Sometimes we hire new staff people and they are confused at the start!!! ***Read caution and when you not allow it don\'t book it just because it\'s cheap and then write bad reviews!!! First of all you need to buy at least 24KÄ tram ticket (validity 30 minutes) and go outside of the building. Once you are out, turn right and go through small park aprox.. 50 meters to the tram stop. Take the tram No.5 or 9 and get off the second stop called 'LipanskÃ¡'. Then look for arrows on the pavement and follow them (across the street, down the stairs...) until you reach the Hostel. First of all you need to buy at least 24KÄ tram ticket (validity 30 minutes) and go outside the railway station to the tram stop. Take the tram No.5 direction 'OlsanskÃ© hÅ™bitovy' and get off after several stops in station called 'LipanskÃ¡'. Then look for arrows on the pavement and follow them (across the street, down the stairs...) until you reach the Hostel. First of all you need to buy at least 32KÄ tram ticket (validity 90 minutes) and go outside the airport hall to the bus stop. Take the bus no. 119 or 254 and go to final stop 'DejvickÃ¡'. Then take subway direction 'Depo HostivaÅ™'. Get off on station 'Flora' where you can take the tram No.5 direction 'HlavnÃ­ nÃ¡drazÃ­' and get off on 2nd stop in station called 'LipanskÃ¡'. Then look for arrows on the pavement and follow them (across the street, down the stairs...) until you reach the Hostel.